For the first time the Museum - lecture hall which has opened in Russia orthodox ringing in detail acquaints visitors with a history and tradition church ringing, art of moulding of bells from times of the first christians up to now. Rich is our Russ in spiritual values and the Orthodox chimes traditions constitute a significant part ofthem, comprising beauty and deep sense of the human existence.Russ offered prayers and strengthened the faith to the sound of bells; bells were an integral part of former generations life. Church bell ringing measured the lifetime of everyone,accompanying in sorrow or celebration.The significance of the Orthodox chimes is great in our days too, when spiritual life of people is reviving. Museum-lectorium of Orthodox bell ringing has been fouded in Russia for the first time, with the purpose to get visitors to know in detail the bell founding craft from early Christianity till the present time.Bells were known from the time immemorial. But theirs christian significance, as a special sacred instrument, were made public in the early years of the VII-th century. 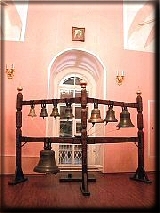 Bells came to Russ from the West following the conversion to Byzantine Christianity at the end of the X-th century. They were rarities at first and overwhelming majority of monasteries and churches used bilos.How a bilo looks like, what differes it from a bell, what they have in common and where bilos are used today? 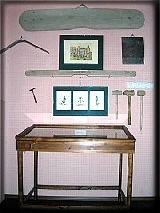 - all that information is contained in Museum's exposition. Among great variety of bells in the world the sound of Russian Orthodox bell is unique and easily recognizable by its rich timbre and remarcable euphony.How a bell comes into being and what good euphony depends on?Russian bell founders always were striving to make bell sounding more beautiful, profound, colourful and euphonious. That was the "Russian type" of bell casting tendency. Museum exposition has at its disposal miniatures, lithographers, models that give general notion of bell casting technology in Russ and in the Vest.Bells, as human beings, have their own history and every social event affects them.In Museum you can become familiar with historical destinies of well-known bells, such as: Tsar-Kolokol, blagovests of Uglich and Solovetsk, famous belfries of Moscow Kremlin, Pskov-Pechery Lavra, the Trinity-St. Sergy Lavra, Rostov Kremlin and others. Here you will find out the names of Russian skilled craftsman who created such remarcable bell craft heritage, the names of eminent bell ringers and to listen to old chimes.Special attention we pay to spiritual and simbolic value of church bell ringing. Our guide will show you all types of canonical chimes. Those who so desire will have a good opportunity of setting a-ringing.Today traditional Orthodoxchimes are going through a developing process: new bells and belfries, skillful bell ringers, casting technology - all that augment spiritual heritage of Russia. You are invited to visit our Museum-lectorium of Orthodox bell ringing in order to open for yourself an interestig historical page of Russian spiritual heritage, to touch and understand the beauty and richness of Russian bell ringing. At Museums-lecture halls the booth where there is a wide range of the literature,audio and video of records on orthodox bell ringing.